Porcelain veneers can can enhance the appearance of your smile in as few as two office visits. Made of thin, durable porcelain, these shells will fit directly over the front surface of your teeth. Once in place, they can hide small chips, reshape the teeth, and conceal minor alignment issues. 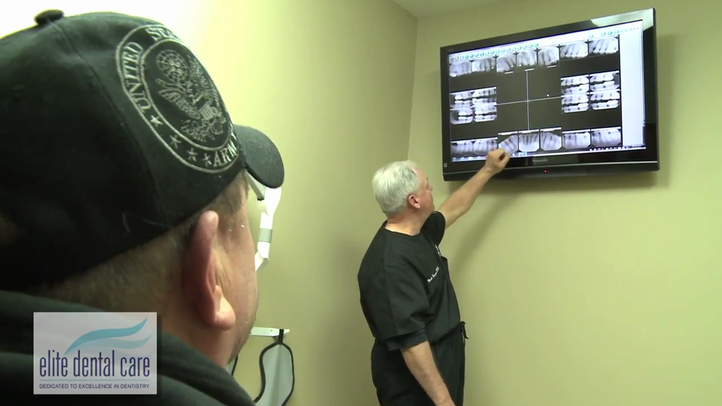 At Elite Dental Care, our dentists use great care when planning veneer treatment. Your doctor will even create a wax-up model to give you a realistic expectation of how your new smile will look after treatment. To find out if you are a candidate for porcelain veneers, contact one of our practices in Germantown, Trenton, or Jackson, TN. Color-matching a porcelain veneer to the surrounding teeth. Porcelain veneers are not designed to address structural damage to the teeth. However, they can dramatically enhance the appearance of cosmetically flawed teeth. Our dentists commonly recommend veneers to conceal internal staining that does not respond to teeth whitening. Veneers can also hide small cracks, chips, gaps between teeth, and other slight misalignment issues. You can improve the aesthetics of your smile with veneers at Elite Dental Care, our doctors can provide these porcelain shells to conceal imperfections without significantly altering the tooth structure. Steven W Kyle shares his story about how the compassionate care he received and his veneers have made an impact on his life. Before creating your veneers, your dentist will make a wax model, showing you what your smile will look like after treatment. This process will also allow you to participate in the planning process, and you can ask for adjustments to the veneers until they meet your unique goals. Once you and your doctor are satisfied with the design, your dentist will carefully reshape your teeth. Trimming away a small amount of enamel will make room for the veneers, allowing them to sit evenly against your teeth. Your dentist will then take impressions, which we will send to one of our partnering dental labs, where technicians will create your customized veneers using advanced materials. Dental porcelain can be shaded to match the color of your surrounding teeth, and has a natural-looking sparkle to blend in with your smile. Once your veneers are in place, your smile enhancement will be apparent immediately. It will take several weeks to fabricate your veneers. Once they are prepared, your dentist will make any necessary adjustments to ensure that they fit comfortably. He will treat your teeth with a mild chemical solution to etch the enamel and create a stronger bonding surface before securing your veneers. Once your veneers are in place, your smile enhancement will be apparent immediately. Before - The patient was unhappy with a dull smile. After - The patient now enjoys brighter, well-proportioned teeth. Porcelain veneers can be an effective solution if you struggle with minor cosmetic imperfections. However, to qualify for treatment, patients must have an adequate amount of dental enamel. If you have suffered dental erosion, you may not be able to undergo the preparation process. Fortunately, we also offer dental bonding and other cosmetic dentistry treatment options. Like many patients, you may choose to combine veneers with another cosmetic treatment for even more dramatic results. Gum contouring is one of the most commonly combined treatments. Using a soft tissue diode laser, your dentist will trim off a small amount of soft tissue to better frame the teeth. Through this process, he can give you a smooth and even gum line. If you would like to address minor cosmetic imperfections in your smile, please contact Elite Dental Care to find out if veneers are right for you.